Very thirsty persimmon tree: What’s a tree got to do to get a drink around here? Summer comes and goes in the Pacific Northwest with nary a drop of rain. It’s Seattle’s best kept secret. Our summers are Miami’s winters. 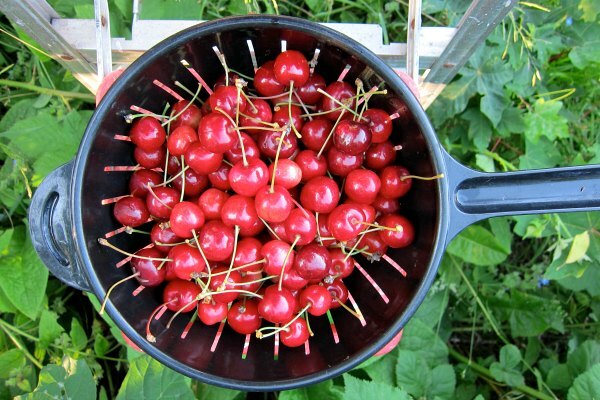 Unfortunately, such a lack of precipitation (while good for picnics) is bad for young fruit trees; they need watering intervention. 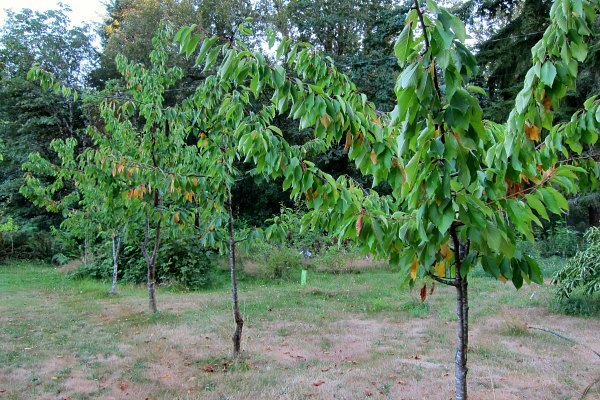 Stressed-out cherry trees: Curled and browning leaves are sure signs it’s time to water. Newly-planted and young trees benefit from extra watering during dry spells. 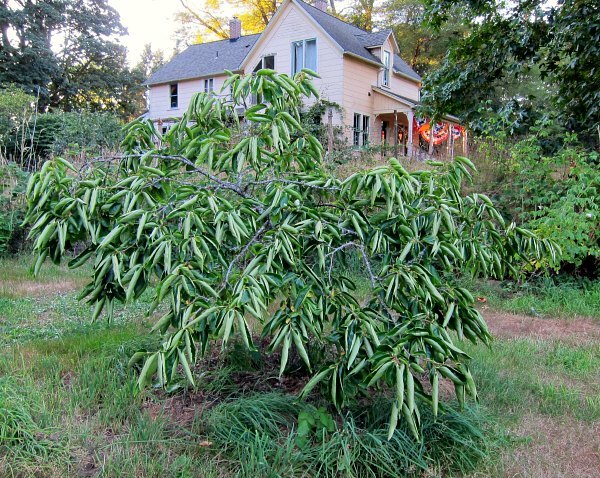 You have to remember that the fruiting and flowering buds set the summer before, so if a tree is stressed and fighting for survival, next season’s crop will likely be sparse if present at all. 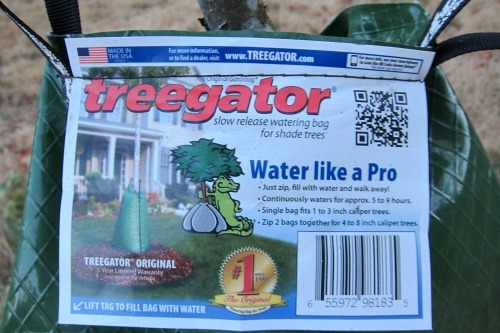 Treegator is a lifesaver for my trees. 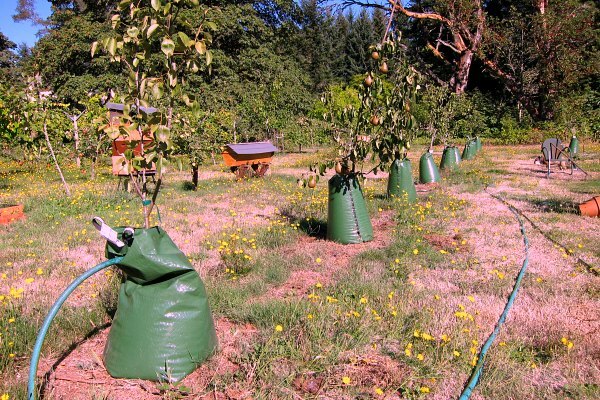 I’ve tried many methods of watering my 60-tree orchard, and found that watering bags like Treegator work wonderfully in quenching a tree’s thirst drop by drop over a five to nine hour period. I water my grape vines with a drip line hose as they run on an long arbor, a Geneva Trellis. Basically (and brilliantly) the bag wraps around the trunk and is zipped up to create a water tower of sorts. Simply fill the bag with water (opening under label flap) and let the water drip slowly out through the bottom pin holes. 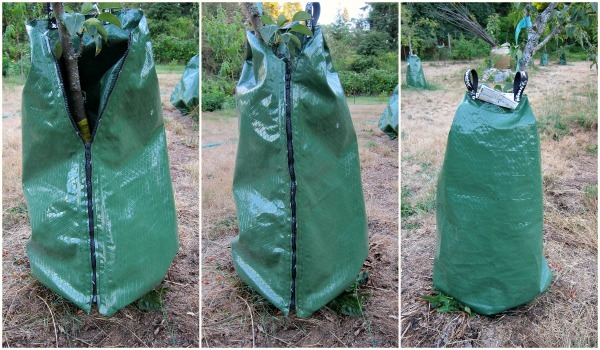 If the tree is older, you can zip two bags together for a larger trunk, and double your watering capacity. Hey that’s what I look like in my down vest. A little pricey, between $19.99 – $25.00 per bag. Disclosure: I am not being paid to endorse either manufacturer’s product. While a bit time consuming, this kind of watering exercise is a great way to unwind after a long day. And on Vashon Island at the height of summer, we enjoy 16 hours of sunlight. In closing, I think this is the best way to water trees, for me. I’d add, if you have a well or water source on your property and have a larger orchard, drip line and irrigation are the way to go. I am on a water district with a limited and costly supply of water, so this works best for me in conserving water and finances. Happy watering, easy picking and warm regards. Looks a LOT better than our hokey way of putting a five gallon bucket at the base of each tree (small hole on bottom of bucket) We have a mini pickup truck with a 55 gal drum of water on the back–we cruise around filling buckets. Yes…….we have been called white trash. I’ve seen bags like this all over St. Paul the past couple of years. The city has been taking out all of our ash trees (due to the ash borer) and replacing with other varieties of young, disease-resistant trees. 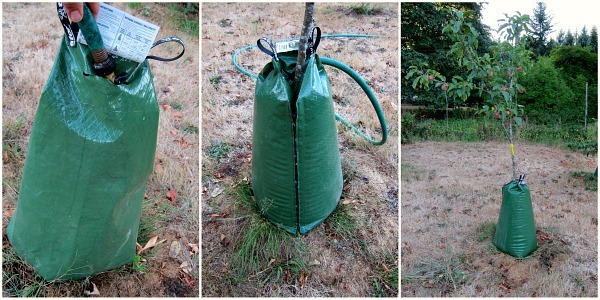 Many people have used similar bags to water. Tom – do you know if the TreeGator bags are available for purchase somewhere on the island? Thanks! Excellent blog, Tom. Let me know if you ever give classes. You are a fount (Treegator) of knowledge.